AquaSafe Travel Pack for peace of mind whilst traveling. 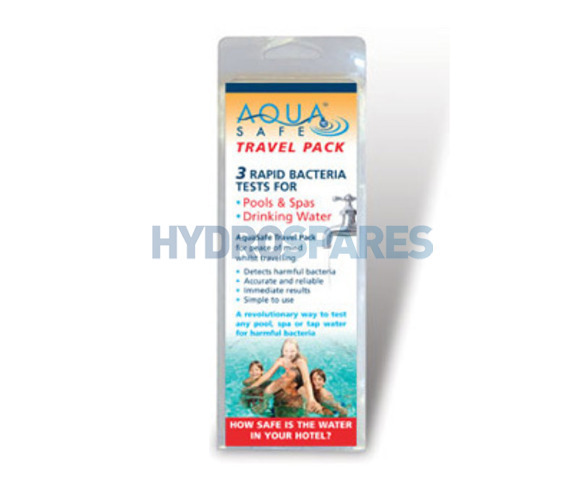 AquaSafe Bacteria Test Strip is an antibody-based rapid test that' detects T Pseudomonas, Aeromonas, E.coli, species of Salmonella, Shigella, Enterobacter, Klebsiella, and many other coliform and non-coliform Bacteria in tap water, swimming pools and spas. The AquaSafe Bacteria Test has all the accuracy and reliability of a lab test in a disposable strip and requires no instrumentation or user training. IF A TEST IS POSITIVE, YOUR WATER SAMPLE MAY CONTAIN BACTERIA LEVELS THAT ARE DANGEROUS TO YOUR HEALTH. FOR HELP AND ADVICE PLEASE CONTACT AQUASAFE ON 0117 956 6694. AquaSafe disclaims any liability resulting from use of this product, failure to follow instructions, or reliance on test results. The product contains two tests, a fast test 48 h and a very fast test strip 20 min. I tested different wells and they seem to work fine. The test results are often comparable. The second line on the test strips is sometimes difficult to see.